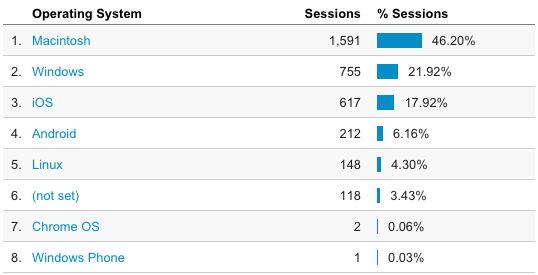 From now on, Google Analytics tracking has been removed from this website. There are a couple of reasons, but the main one is that I don’t really care. The data collected since January 1st 2014 – so 2 years – also tell me that I should not care. Most is either useless, evident or annoying. 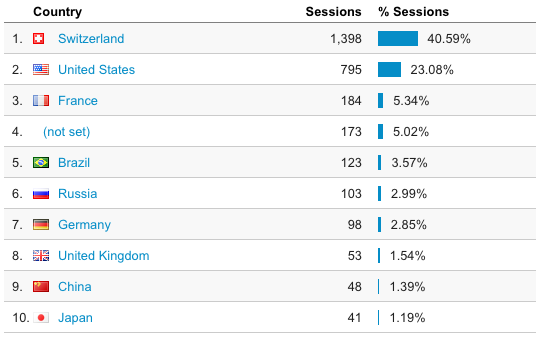 Who are these people from Brazil, Russia, the UK, Japan? Brazil might be explained by new Doodle users, as my website is linked to from the team page. The same goes for the cities. Do you know where Burlingame and San Carlos are? It turns out they’re in the SF Bay Area, next to SFO San Francisco International Airport. So that’s most likely Alex :) I can’t really explain Los Angeles though. 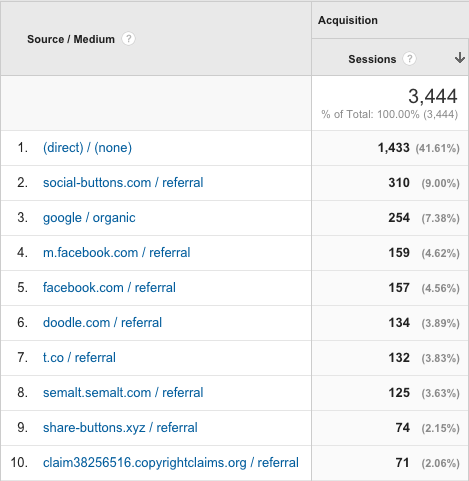 The direct referrals surprise me a bit, because most people who know about my website can’t remember its address. Referrals from Facebook and Twitter are expected because that’s where I post links to newly published articles. The referral number from Doodle is slightly surprising because I didn’t expect people to actually click on the link on the team page. The fact that the homepage is the topmost page doesn’t help to determine the favorite article, as almost every article was the homepage at some point2. Why is this data disappointing? Because the articles I spent most time writing or that I find most interesting are not the most read it seems. Basically any visitor that spent under 180 seconds did not read anything. Most of the sessions fall into this group. 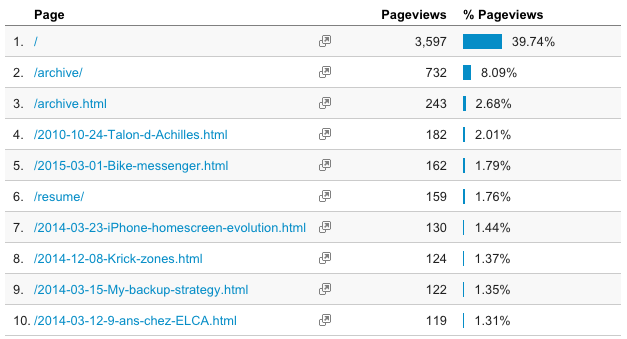 However a majority of pageviews fall into the 180+ seconds group. I would say this means that most people are not interested in anything I write, which is understandable and doesn’t bother me at all. There is however a small group of people – I would like to think that it’s my friends and family – that actually do read my articles. Or those that open the page, leave the browser tab open, go get coffee and never come back (1801+ seconds is more than half an hour). 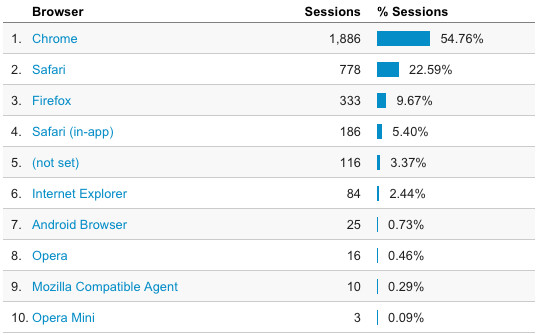 Mac wins over Windows, iOS wins over Android, and the Chrome/Safari/Firefox trio ridicules Internet Explorer. 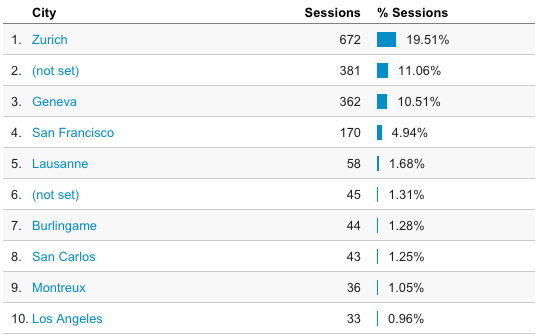 Who the hell are those Opera Mini users?